The finest phase in the history of peaceful political protest by Sri Lankan Tamils was in 1961. A non – violent “Satyagraha” campaign conducted by the Ilankai Thamil Arasuk Katchi(ITAK) virtually paralysed administration in the pre-dominantly Tamil districts of the Northern and Eastern provinces of Sri Lanka at that time.Though the civil disobedience campaign was launched by the ITAK known in English as the Federal party, representatives from other political parties also cooperated in a show of broader Tamil unity. The high watermark of the protest campaign was in Jaffna where thousands of peaceful Satyagrahis engaged in a sit down strike throughout day and night in batches outside the premises of the Jaffna Kachcheri or administrative secretariat. The Satyagraha that began in early 1961 continued for several weeks till mid – April. After her birthday on April 17th , the then Prime Minister Sirima Bandaranaike deployed the armed forces in large numbers to bring the campaign to an end. Soldiers cracked down on the unarmed peaceful protesters comprising men and women of all ages in the darkness of night. While ordinary volunteers were assaulted the frontline leaders were arrested. The military operation aimed at crushing a non – violent Satyagraha through force was commanded by Col. Richard Udugama. This bold act of defiance by Murugesu Sivasithamparam was perhaps the finest hour in the political career of the Tamil Political leader. Though elected from the rival All Ceylon Tamil Congress (ACTC) as MP for Uduppiddi in the 1960 elections, Sivasithamparam had shed party differences in 1961 and participated in the massive Satyagraha campaign launched by the FP. He was a member of the action committee that coordinated the campaign in Jaffna. When the “illegal” Tamil Postal Service was organised as part of civil disobedience, separate stamps and envelopes were printed. Sivasithamparam acted as one of the ‘postmen’ and delivered an ‘official’ letter informing the Jaffna police Supdt of the postal service. After being assaulted severely by the army while trying to protect women Satyagrahis , the be-spectacled MP was hospitalised for days.This incident increased Sivasithamparam’s political stature among the Tamil people. Interestingly Sivasithamparam was not placed under house arrest at Panagoda along with FP leaders and stalwarts by the government then. This was a not so subtle move to divide the FP and TC who were coming close politically then.Sirimavo Bandaranaike’s government of 1970 to 77 also resorted to such stratagems in 1976. The newly formed Tamil United Liberation Front(TULF)leaders were distributing leaflets critical of the 1972 Constitution in Jaffna. Messrs A. Amirthalingam, M. Sivasithamparam, K. P. Ratnam, K. Thurairatnam and V. N. Navaratnam were arrested.Thereafter Sivasithamparam of the Tamil Congress was released while the other four, all of them from the FP were taken to Colombo and detained for 10 days. This was followed by the famous trial – at – bar case over charges of sedition against Amirthalingam and the other three in which 67 Tamil lawyers including 6 QC’s appeared for the four accused. Very little is remembered or known by the younger generation of Sri Lankans about the nature of non – violent Tamil Tamil political struggle that preceded the violent armed struggle. Indeed for many the history of Tamil political resistance to what was perceived as majoritarian hegemony commences only from Black July. To many on either side of the ethnic divide , Veluppillai Prabhakaran personifies the beginning, middle and end of the Tamil struggle. The course and content of Tamil politics prior to the advent of the birth and growth of the Liberation Tigers of Tamil Eelam (LTTE) is conveniently forgotten or not taken into account at all. Yet the fact remains that the Tamil quest to achieve equality in the Island was basically non – violent prior to 1983. A prominent Tamil political leader of this period was Murugesu Sivasithamparam who is the focus of this column this week. Former Parliamentarian, Deputy speaker and President of the TULF , Murugesu Sivasithamparam hailed from Karaveddy in the Vadamaraatchy division of Jaffna peninsula. He was born on July 20th 1923.There is a saying about prophets not being honoured in their own country. That does not seem to be the case as far as Sivasithamparam and the people of Karaveddy are concerned. They have already erected a statue of Sivasithamparam at the key Neliaddy junction.Now on July 19th they intend organizing a memorial meeting to commemorate the 93rd birth anniversary of this distinguished son of Karaveddy soil. The memorial meeting will be held at the Aingaran Araneri Paadasaalai Mandapam in Karaveddy. It will be preceded by a ceremony in which Sivasithamparam’s statue would be garlanded. The Meeting will be chaired by Mr. V. C. Ponnambalam of Karaveddy who is the livewire behind the event. Incidently Ponnambalam who was closely associated with the tycoon Upali Wijewardena and worked at Upali group for many years is still known in his hometown as “Upali”Ponnambalam. ( I mention this here to denote the strong links existing between North and South and how these bonds were viewed appreciatively by ordinary people). Cabinet Minister and Sri Lanka Muslim Congress (SLMC) leader Rauff Hakeem will deliver the memorial lecture. He is expected to speak on the challenges facing the current good governance Govt of President Sirisena and Prime Minister Wickremesinghe. The chief guest at the event will be Tamil National Alliance(TNA) chief and Opposition Leader Rajavarothayam Sampanthan. Among speakers scheduled to address the meeting are former Jaffna High Court judge E.T. Vicknarajah, ex – Jaffna varsity Professor S. Sivalingarajah, former “Thinakkural” newspaper Editor – in – Chief V.Thanabalasingham and Lawyer Kandiah Neelakandan. 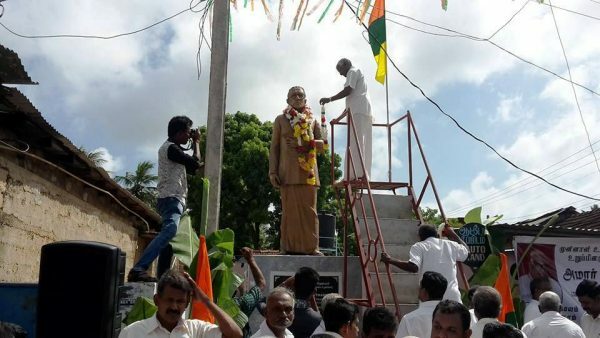 Despite the presence of Sampanthan at the event it must be noted that neither the commemoration nor the construction of the statue had anything to do with the TNA. The people of Karaveddy deserve all credit for celebrating the life and memory of Murugesu Sivasithamparam. It is indeed appropriate that Rauff Hakeem the leader of Sri Lanka’s foremost Muslim political party should be invited to deliver the first lecture in memory of Sivasithamparam. The mercurial Tamil leader was one who was deeply troubled by deteriorating relations between the Tamil and Muslim communities. Greatly affected by the mass expulsion of Muslims from Jaffna by the tigers in 1990, an anguished Sivasithamparam declared that he would set foot in Jaffna only after the Muslims of Jaffna returned to their homeland.He remained faithful to his pledge until his demise. It was only Sivasithamparam’s body that was brought to Jaffna to be cremated at the traditional “Sonappu” cemetery in Karaveddy. M. Sivasithamparam as he was generally known passed away in June 2002.He was a legislator in Sri Lanka for nearly 17 years and represented the Udupiddy electorate that included his own place Karaveddy among other areas. He represented Uduppiddy for a decade from 1960 to 1970.This identification led to the description “Udupiddy Singam” (Lion of Udupiddy) in Tamil.He later contested the Nallur electorate in 1977 and remained MP till 1983.Despite his moving to the Nallur constituency as its MP in later years and in spite of his absence in parliament from 1983 to 2001, Sivasithamparam was continuously called Udupiddy Singam. His boomingly powerful voice too is leonine in tone and another name for him is “Simmakkuralon Sivasithamparam” (lion-voiced Sivasithamparam). He was at the time of his death the senior-most Tamil parliamentarian, having been nominated in 2001 on the national list by the newly formed Tamil National Alliance. Known affectionately as “our Siva” or “Em Siva” in Tamil on account of his initial “M”, Sivasithamparam was a towering personality in the political landscape of the island. A well-built six footer with a stentorian voice, the mercurial M. Siva was for more than four decades an accredited leader of his people. The brilliant lawyer was a powerful orator and ebullient debater who cut a flamboyant figure at the height of his career. Murugesu Sivasithamparam was a politician with whom I interacted closely as a reporter on the Tamil Daily “Virakesari” , the English Daily “The Island” and as Colombo Correspondent of the Indian newspaper “The Hindu”. My mother’s village, Thunnaalai, was adjacent to his Karaveddy. In fact, the postal address was Thunnaalai South, Karaveddy. It was part of the Udupiddy electorate that Sivasithamparam represented for many years. Most of my relatives, however, were either Federalists or Communists in the pre-TULF years and therefore opposed him.My father and he were colleagues at the bar as fellow advocates. Although my parents were acquainted with him, my relationship with Sivasithamparam was developed over the years in my capacity as a journalist. As is usual in any professional interaction between politicians and the press, it had its twists and turns. In my early years as a reporter on the Tamil daily Virakesari, I once wrote a news story that was quite adverse to the Tamil Congress quartet of MPs in the TULF.Their response was not published in the paper due to matters beyond my control.When I ran into some TULF MPs, including Sivasithamparam at Sravasti, he began accusing me unfairly. I defended myself as far as possible but was constrained by the fact that I could not reveal to an outsider what had gone ‘wrong’ inside the editorial dept of the paper. Fortunately, former Vaddukkoddai MP, Thirunaavukkarasu, who had found out through his sources about what had exactly happened at “Virakesari” came to my rescue and explained the truth to him. At that point, Sivasithamparam’s namesake, the MP for Vavuniya, interjected and said, “Siva, you have hurt this young man’s feelings badly.”Realising that I was not at fault, Sivasithamparam acted in a manner that I can never ever forget! He stood up in the presence of his fellow parliamentarians and to my embarrassment folded his palms in the traditional fashion , apologised profusely, and sought my pardon saying “Thayavu seidhu ennai Manniyungo”(please forgive me). Such was the greatness of the man. Later on our relationship improved greatly. He once made a glowing reference in parliament to my column in The Sunday Island, “Behind the cadjan curtain.” and said “read DBS Jeyaraj’s graphic account to know the truth”.Unlike many politicians, he was not a gregarious personality and was quite reserved. As time progressed I reached the stage of exchanging remarks in lighter vein with him. He also began trusting me greatly and revealed ‘off the record’ much of what was going on and what he felt about men and matters to me. I last saw him in person in September 1988 when he was staying at the Taprobane (Grand Oriental Hotel) in Colombo. He was very unhappy over the IPKF-LTTE conflict and quite gloomy about the future. He was reading a book of collected writings by former Indian Governor – General and Swatantra Party Leader, C. Rajagopalacharyar, known generally as Rajaji.That image remains poignantly etched in memory because there were many aspects in common between Sivasithamparam and Rajaji once described as his “conscience keeper” by Mahatma Gandhi himself. After I went abroad our contact was minimal and restricted to infrequent telephone calls. When I spoke to him the last time and inquired about his health, he replied dejectedly in Tamil, “Kaadu vaa. Vaa ennuthu” – The cemetery is beckoning me come, come.” When I saw pictures of Sivasithamparam’s return in 2001 to Lanka from India in the newspapers the change in him was very visible. His once impressive physical appearance had decayed badly. Age, sickness, and above all worry, had taken its toll. Still, the old lion had the guts and gumption to return. He was persuaded by the TULF old guard to do so as the stamp of his leadership was sorely needed.There was also the question of preventing disintegration because of national list seat intra-rivalry. Sivasithamparam was incorruptible and a paragon of virtue in every sense of the phrase with not a whiff of scandal about him ever. Focussing on politics at the expense of law and the post-1983 developments had impoverished him considerably. His house at Norris Canal Road and two vehicles were burnt in 1983.After more than a decade, then Rehabilitation Minister M.H.M. Ashraff tried to compensate him partially for the losses. A Tamil politician with an axe to grind manipulated some newspapers into publishing negative comments about this. Sivasithamparam promptly declined to accept his rightly deserved compensation. In his later years he underwent tremendous financial strain. Yet he would not accept anything for his personal use. It may be hard to believe that a man who was born wealthy and acquired much wealth as a successful professional could be reduced to such deprivation.This is in stark contrast to many of our present Tamil ‘leaders’ whose sole concern has been to make money through dubious means. Siva however was very careful about getting material ‘help’ from extraneous elements in any form. Many years ago in the eighties, Sivasithamparam once told me about a top Tamil leader who allowed himself the munificent patronage of a prominent Tamil businessman in Colombo. Thereafter, he lost his independence. Siva pointed this out to me in confidence saying “Nakkundaar Naavilanthaar” (Those who lick others for food lose their tongue).He was equally careful about the TULF too. Though the party was hard strapped for cash and lacked resources to do politics like the ex -militant groups, Sivasithamparam refused to resort to shady means to get finances. The TULF then relied mostly on contributions by supporters and well wishers rather than depending on other vested interests. When the envoy of a country deeply involved in Sri Lankan affairs donated money for a vehicle for the party, Sivasithamparam accepted it reluctantly due to pressure from party members. However after much agonising Siva returned the money in full without utilising it. Contrast this with the conduct of some Tamil provincial representatives seeking luxury vehicles from the very same country. Siva was a devout Saivaite and lifelong vegetarian. Worship for him was a long ritual and took up much of his time. In the old days when one rang him at home and was told that he was doing “pooja” there was nothing else to do but replace the receiver, because one knew Sivasithamparam was not going to be free in a hurry. Many years ago in 1987 I wrote an article in The Sunday Times about the current state of the former TULF MPs elected in 1977(“Where have all the TULFers gone?”). In that I remarked in lighter vein that Siva, living with his Indian son – in – law in Chennai, had transplanted the ‘thesawalamai’ to India.The custom in Jaffna is for the groom to live in the bride’s house and vice versa in Tamil Nadu. However Sivasithamparam’s son in law was staying at his wife’s esidence with his in – laws.When I met Siva some time later in Colombo he referred to the article and said “I know you were making a jocular observation. But it hurt my son in law. To tell you the truth Thambi, we are actually experiencing his generosity”. I was very sad to hear it then. M. Sivasithamparam was born to patrician wealth as the scion of a ‘maniagar’ or hereditary chieftain in charge of a revenue division. The family owned a lot of property. He also acquired much prosperity as a successful lawyer. Siva appeared in landmark cases concerning the Tamil armed struggle like the Thuraiappah murder, Neervely robbery, Puloly bank robbery, Kuttimani and Thangathurai cases etc. Later, scheming persons concerned about his growing popularity manipulated matters and sidelined him from cases of that type. There was a time when Sivasithamparam was the uncrowned king of the magistrates courts. He had an extensive and lucrative practice with a very large number of Sinhala clients. Yet, he sacrificed almost all his wealth in politics. More importantly, like Amirthalingam, he denied himself enhanced material prospects by engaging in full time politics. As stated earlier Siva was of aristocratic lineage being the scion of a “maniagar” or hereditary chieftain in charge of a revenue division during the colonial days. The younger Sivasithamparam, however, was enamoured of marxism and a card-carrying communist party member in his undergraduate days. He dropped out of university and took to law becoming an advocate. He also abandoned communism and took up the cause of Tamil nationalism by joining the All-Ceylon Tamil Congress. Siva contested the Point Pedro electorate in the Jaffna peninsula as an independent candidate in 1956 and lost. He was returned to Parliament for the first time in March 1960 winning the newly created Udupiddy seat on the Tamil Congress ticket and repeated his performance in 1960 July too. 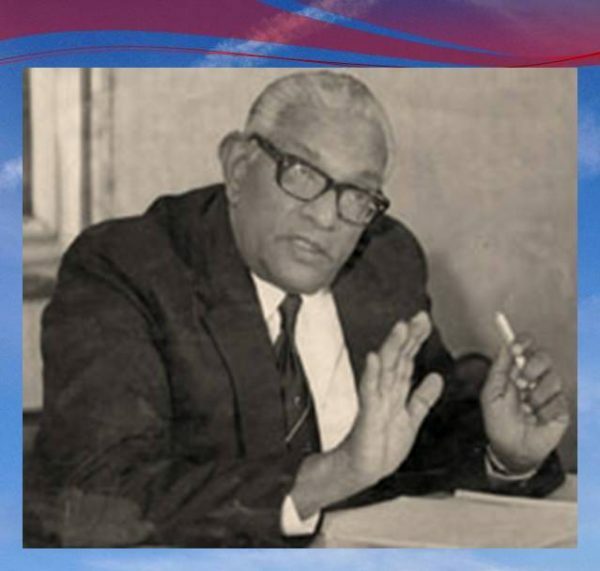 He was then the sole representative of the party in a Parliament of 157 MPs.Sivasithamparam won again in 1965 March and the Tamil Congress with three seats joined the national government of Dudley Senanayake. In 1967, the then Speaker, Sir Albert Peries of Nattandiya died and was succeeded by his deputy Shirley Corea of Chilaw. The deputy speaker’s office was filled by Sivasithamparam. He served as deputy speaker of parliament from 1967 to 1970. He was proficient in all three languages and presided over the House in a creditable mode. Once when T. B. M. Herath of Walapane was troublesome, Sivasithamparam spoke to him in chaste Sinhalese and tactfully persuaded the overwhelmed Herath to yield. On another occasion Siva admonished his own leader G. G. Ponnambalam – much to Ponna’s chagrin – for unfairly criticising Amirthalingam when the latter was not present in the House.In spite of the prestige he acquired as deputy speaker, Sivasithamparam lost his seat in 1970 to K.Jeyakkody of the Federal Party in what was widely regarded as an electoral upset because the ‘Udupiddy lion’, regarded as unbeatable was beaten in his own den. The turbulent seventies saw the Tamil parties forming together the Tamil United Front in 1972 which went on to become the Tamil United Liberation Front in 1976. The TULF contested the 1977 elections on a separatist platform.The Udupiddy electorate had a substantial concentration of “dalits” or so called low caste Tamils. Sivasithamparam moved out of the constituency to Nallur at the polls to enable a minority Tamil candidate to be fielded. Former educationist T. Rasalingam contested and won in Udupiddy. Sivasithamparam though contesting the unfamiliar semi-urban terrain of Nallur, rode the crest of a TULF wave. He swept the seat with 29, 858 votes and created history by recording the largest majority of 28, 137 votes in the entire country in that election. The 1983 July violence resulted in a tragic upheaval for the Tamil people. Thousands of families were affected and uprooted. Sivasithamparam’s house, car and jeep too were burnt in Colombo and his family members escaped death miraculously. They, along with many others, relocated to Tamil Nadu.The former Chief Minister of Tamil Nadu M.G. Ramachandran, allocated a flat to the family. The TULF president thereafter remained a resident of Chennai although interspersed with long periods of absence for political work in Sri Lanka leaving his family behind. The TULF forfeited its Parliamentary seats in 1983 by refusing to take the mandatory oath of allegiance to a unitary state as provided for by the hastily passed Sixth Amendment to the Sri Lankan Constitution. It, however, welcomed the good offices of India and cooperated fully in the mediatory efforts undertaken by New Delhi. Sivasithamparam, along with his TULF colleagues Amirthalingam and Sampanthan , participated in all forms of India-sponsored negotiations, including the aborted talks in Bhutan in 1985. In 1987, the TULF accepted the Indo-Lanka accord and re-entered the political mainstream of the island. M. Siva survived with injuries an assassination attempt by the LTTE in 1989. TULF leaders Amirthalingam and Yogeswaran were killed in the incident. He was shot in the chest and underwent a long stint in hospital. Thereafter the mantle of TULF leadership was Sivasithamparam’s. He shuttled between India and Sri Lanka while facing considerable hardship.Despite the incident and a number of other LTTE attacks on TULF personalities, the TULF established cordial political relations later with the Tigers and accepted their overall leadership as part of the Tamil National Alliance. 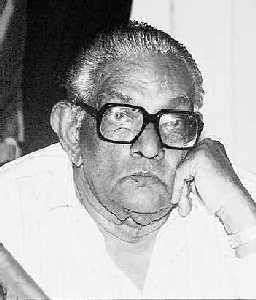 Sivasithamparam remained active in politics and was even prepared to play second fiddle to the LTTE not because of power hunger, ambition, cowardice or opportunism but because of a deep sense of commitment.Siva felt that he and others of the TULF old guard owed it to the Tamil people because it was the TULF that brought separatism into the political discourse. Therefore, he felt that he was duty bound to see things through until a satisfactory settlement was reached and durable peace with justice was achieved.This explains certain types of action that may seem blatant compromises to many. The intention however was clear and pure. Sivasithamparam contested the Jaffna and Wanni electoral districts in 1989 and 1994 respectively. He failed to gain representation in the polls conducted under the proportionate representation system. The TULF was actively involved in the peacemaking efforts of former President Chandrika Kumaratunga and Sivasithamparam himself played a commendable role in it. Ill-health in 1998 compelled him to return and stay continuously in Chennai till early 2002. He did not contest the elections of 2000 and 2001. The 2001 poll, however, saw four parties, including the TULF, forming the Tamil National Alliance and contesting. It won 14 seats and, on the basis of the votes received, was entitled to one nominated seat on a national basis. Sivasithamparam was the unanimous choice for the seat. Despite his failing health, the old warhorse returned to Colombo to become an MP again and played once again a role in the island’s politics, albeit under changed circumstances. A friend who saw the gentle giant sleeping on a narrow bed in a small room in Colombo told me it was like “seeing a lion chained in a dog’s kennel.” At the time of death, Siva had been reduced to much deprivation.The thing that mattered most to him however was the restoration of Tamil rights and the achievement of political equality on the island. It was that goal which drove him on, despite his ailing state of health. The veteran Sri Lankan Tamil political moderate died peacefully after a brief illness in the Colombo National Hospital at 1-50 a.m. on June 5 2002. The lion of Uduppiddy roared no more! Murugesu Sivasithamparam left behind his wife, son and daughter and their families. Like many Tamil politicians of his vintage, Sivasithamparam believed in the creed of Gandhian non-violence as a form of political articulation. It could be truly said that with his demise an exemplary manifestation of Tamil politics came to an end. Few of his ilk are left in Sri Lankan Tamil politics today. I commend the people of Karaveddy for keeping the memory of Murugesu Sivasithamparam alive.